My husband described this as divine! A Little ray of sunshine after a busy day!Also prawns or shrimps are a great protein source.I prefer eating prawns over other kind of seafood anytime.It’s probably the texture and also the fact that they are super easy to cook once they are clean. I usually end up buying fresh prawn from freshtohome here in Bangalore.It’s super convenient and the quality is great! Read more about the exact dietary details in the nutrient details in the recipe box. The curry is very healthy on it’s own.You can reduce the calorie density by diluting it with more water.Also add veggies to increase it’s fiber content. Traditionally the type of a curry is eaten with rice- Red or Raw rice.If you are looking for a low calorie- high fiber alternative, then you could pair this with millets too.Foxtail millet and kodo is an excellent replacement for rice.You can read more about millets in my post here. A paleo or Whole 30 meal version will be this curry served with some cauliflower rice. Is prawn and Shrimp the same thing? Though they are different, for the purposes of cooking prawn and shrimp are the same.In india, Australia and Uk, we usually call this type of seafood “Prawn ” while in USA it’s called “Shrimp”. Instant Pot Prawn Curry – This dish can be made in the SAUTE mode in instant Pot in the exact way as mentioned below. Prawn – Prawn Cooks very fast (just about 3-5 minutes) and turns orange on cooking.Do not cook the prawn beyond this time. Also ,for a better looking dish – Keep the tail of the prawn on. Coconut Milk – The best coconut milk is the homemade kinds.It has an amazing flavour and taste.If you don’t have the time to make it at home, buy canned or boxed coconut milk.The last resort should be the dried coconut milk powders.They have the least flavour but they can be stored for longer and are very handy! 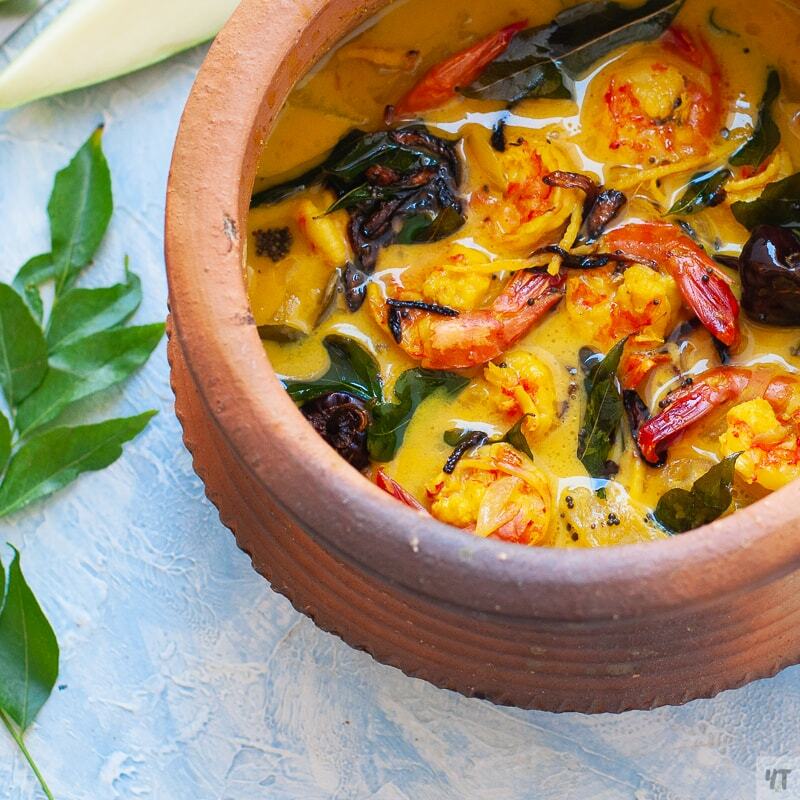 Prawn Curry with Raw Mango – Indian Shrimp Curry also called Chemmin Mango Curry made with Prawns or Shrimp , coconut milk and sour raw mangoes. Bring the pot to boil.Add Mangoes and cover.Cook for 10 minutes. To this, add the prawns.Cook for 5 minutes without a lid. Once Prawns Turn orange, add the coconut milk.Stir and bring to boil. In a tempering pan(small frying pan) add oil and heat. Once oil is hot, add the mustard seeds.Once they splutter- add Curry leaves & red Chillies.Cook on high for about 30 seconds. Here are some more Prawn recipes for you!